The city of White Rock is known for its beautiful landscapes and waterfront. Unfortunately it’s homes and commercial buildings can host a variety of pests as well. Protecting your White Rock residence from pests like bed bugs, wasps, rodents, ants, or fleas is a significant step in safeguarding its value and structural health. Pests are worth getting rid of even just to have a good backyard experience free of wasps stinging or ants. Most people get suprised, distressed and repulsed when coming across pests in their homes. After their presence is detected, one has to wonder how many of the bothersome creatures continue living, and how tricky it may be to get rid of them. Once matured inside your apartment, condominium, or business, pests can threaten your sanity, your health and your home. Do not overlook the attendance of a cockroach or any other pest and hope it will disappear. It’s a must that you take measures to deal with pests immediately before they multiply into a problem that you will be unable to handle. Since pests will take a range of routes to stumble on their way into your apartment. Insects enter into your apartments through feebly sealed or open windows and doors, cracks and crevices in walls or foundations, and openings around pipes and other penetrations. Insects have the ability to squeeze through even extremely small openings. Vents and air ducts can make available an opening point for birds, rodents and insects. Insects can also attach themselves to pets, or to people and the items they are carrying. The earliest prevention will help. The following tips will help you to prevent the presence and increase of bed bugs. Clean and dry out your divan linens often using the hottest temperature. Have a close check up on any second-hand furniture as well as your residence on a regular basis – after a move or trip. Cockroach Control: To get rid of cockroaches in a home or business kitchen, etc. – have done a high-quality examination. Use a fogger or fumigation to get them out, chase them into sprayed material which will obliterate them instantaneously. Do away with cockroaches by killing them with the tips from a qualified pro exterminator. Here come basic tips to eliminate the source of the mouse infestation. Remove mouse friendly food resources. Annihilate their shelter and cover. 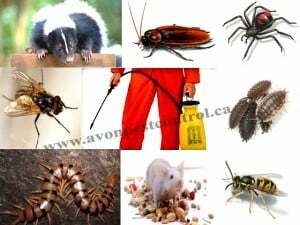 The best way to get rid of these pest problems is to contact Avon pest control; our pest control services for the White Rock and South Surrey area will defend your home against invasions by termites and other pests, and will be of assistance to you to retain its value. See also this page about Surrey Pest Control Services.